Zoe (pictured below) learned about the importance of nutrition and food security through Canadian Feed The Children’s (CFTC) partnership with her community – and this past winter she decided to give back and help other children in communities in Africa who are working towards the same goal. Zoe is from Chippewas of Nawash Unceded First Nation – a community located on the Saugeen (Bruce) Peninsula – and one that CFTC has been partnering with to improve local food security since 2013. Students at Zoe’s school, along with the broader community, have benefited from the partnership with CFTC through the development of a culturally meaningful, holistic food security program. The program includes school breakfast and lunch, in-class nutrition education, family outreach, inter-generational activities with community elders, a school garden and a new Fresh for Less program providing the community with affordable healthy food. In all of these activities, a key focus is on empowering youth to make changes in their own lives and communities by giving them the support and tools to do so. The students at Cape Croker Elementary School have shown incredible leadership skills and have quickly become nutrition advocates for their own community. 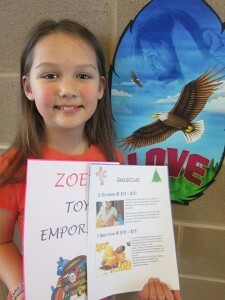 After seeing the positive change on her peers and in her community, Zoe decided this past winter to connect with children in different communities in Africa by fundraising for their food security programs through CFTC. CFTC is grateful to Zoe for her generosity, and for being a heartwarming reminder of the sustainable, global change you support when you make a difference in children’s lives.